Halloween is approaching fast and I am sure most of you have parties lined up for this weekend all the way until Halloween. If you don’t already have a costume idea in mind, then here are some quick costume ideas that are also easy on your budget. For most of these ideas, check your local Goodwill or local thrift store before purchasing items brand new. Don’t forget to ask to borrow some of these items from your friends. It is better to borrow than to spend money on something you will probably never wear again. I made sure these costumes would not require too many DIY projects because time is running out before Halloween. Don’t forget to get creative though! Use items you can find around the house. Accessories are key when it comes to a good Halloween costume, so don’t forget the details. When most women run out of time (I’ve done it plenty of times), they just dress up as a witch. This year, try something different; ditch the witch hat and have some fun! Dig up an old prom dress and some heels. Put on a lot of makeup and oversized jewelry. Don’t forget to make a sash! All you will need is some 3’’ white ribbon and a black sharpie. Write Miss America on the sash and you are ready to go. Don’t forget to mention how much you want world peace! Start with some black jeans and a black long-sleeved shirt. 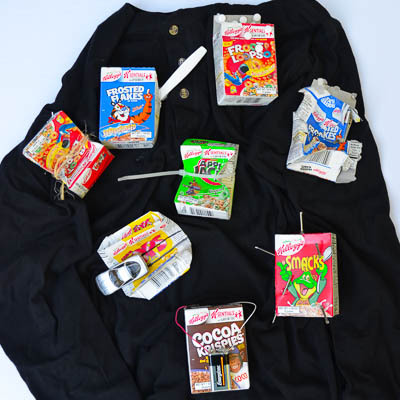 Then, glue mini cereal boxes all over the front and back of your shirt. Stick plastic knives into the boxes and splatter some fake blood on the cereal boxes. You’re a cereal killer. Trust me, this witty costumes will get you some attention! Dress in white or tan from head to toe and apply some dark eye makeup to your eyes. Easy as that! You are truly a black-eyed pea. All you need is a white shirt, some black short-shorts, and a black waitress apron. If you are not already blonde then get a blonde wig and tie it into a side ponytail. Don’t forget your Merlotte’s logo. Cut an oval from green paper and write Merlotte’s with a white sharpie. Optional: Take black waterproof eyeliner and draw a line in between your two front teeth to mimic Sookie’s gap in her two front teeth. Cher sports the iconic 90s, preppy teenage style. All you will need to imitate her look is a white long-sleeved colored shirt, a plaid mini skirt, and some white knee-high socks. Wear any kind of flats, preferably some Mary Jane’s. Part your hair down the middle for a full-on 90s look and don’t forget the shopping bags; these are your key accessories! This costume is similar to the Miss America costume. Find your old prom dress or homecoming dress and buy a cheap tiara. Don’t forget the heels! Now you can be a queen for one night! 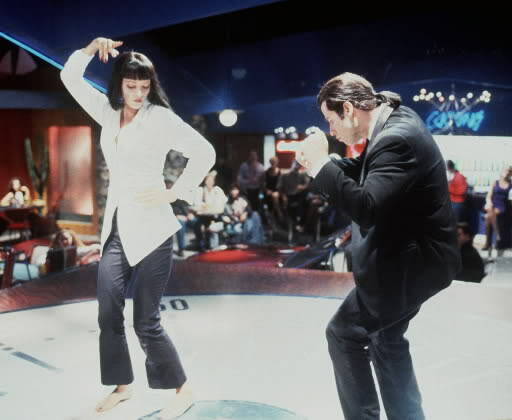 Pulp Fiction is a classic Tarantino film and Uma Thurman plays the troubled Mia Wallace so well! All you will need to buy is a black, bob wig. The rest is simple: black pants, an oversized button-down, white shirt with a black undershirt and black flats. Optional: carry around an unlit cigarette. Buy some devil ears and a devil tail. Then cut out a piece of white poster board in the shape of an egg. Paint the poster board like the inside of an egg and hang it from a string around your neck. It’s clever and easy! 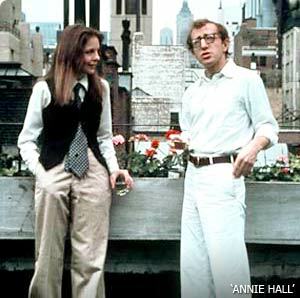 Woody Allen makes classic films, but none of his films tops Annie Hall, in my opinion. Annie has the 60s, androgynous look and Diane Keeton rocks the style in the movie. You’ll need some oversized khaki pants, a white button-down shirt, a man’s tie and a black vest. Make sure your hair is a little disheveled just like Annie’s! There are many ways you can go about this outfit, but I prefer the classic, stereotypical French look. Find some black tights, a blue and white striped t-shirt, a red skirt, some black flats and a beret. Optional: carry around a baguette and eat it throughout the night and repeat “oh la la” and “bonjour” to all of the guests at the party!